Why does my FedEx Tracking link display an error? Order's FedEx tracking link on the order displays an error message. Store is not registered correctly to FedEx WebServices. When using FedEx as your real-time shipping carrier, it is important that you correctly register your store with FedEx's WebServices. Failure to do so will result in the store's inability to properly use FedEx's tracking service when using the tracking link. 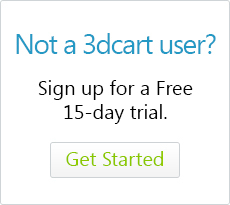 Please click here for information on Registering your 3dcart store properly.